The Clouded Leopard Project is dedicated to the conservation of clouded leopards and their habitat by supporting field research, implementing education initiatives in range countries, and bringing global awareness to clouded leopard conservation issues. We invite you to learn about this amazing, endangered cat and help spread the word about its conservation needs. You can support clouded leopard conservation by making a donation or by purchasing from our online store. 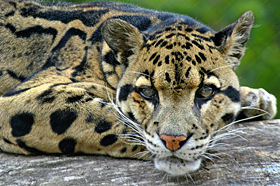 The Clouded Leopard Project website serves as the official website of the Association of Zoos and Aquarium's Clouded Leopard Species Survival Plan®. We invite you to learn more about Clouded Leopard Project activities. Your donations help fund projects studying wild clouded leopards and working with local communities. Check out these videos to see your support in action!